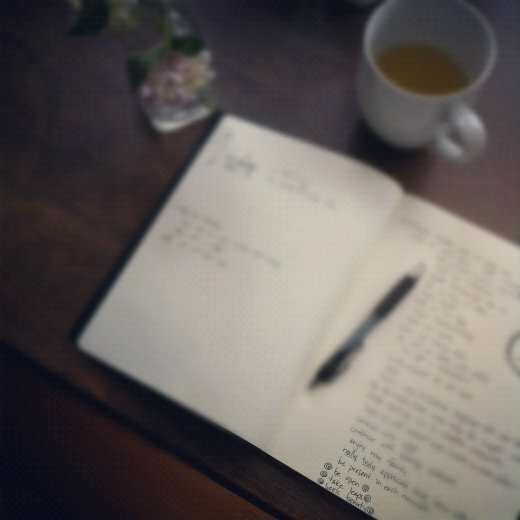 journaling over the weekend, i was inspired to make a list of things i’d like to do, things i’d like to work on. not a daily to-do list of things like laundry, dusting, etc. but a list of bigger, further-out things. things to get me focused, organized, motivated. by the time i got to the bottom of my page, my list had shifted from fairly practical items to three items that caught my attention. three items that gave my heart a little squeeze and blew a whisper of yes through my being. i like how my list evolved as i traveled down my page. i like how i felt…still feel…the rightness of these challenges to myself. i like these three items. do you ever make lists??? I make a list or two a year, I am not much of a list maker except for with the childrens schooling, in that case I have to make lists or we would never get anything done;) I probably should write things down, it would help ease the pressure in my head, I think! Billy is a list maker and sometimes it drives me nutty cause if it didn’t make it on the list it’s never getting done..haha! I am an obsessive list maker…I have a bunch of cute little books that I make my lists in…and then, once they are written, I do something else and forget all about my list. When I find my lists much later I frequently find that I have done what was on them anyway. I am perhaps a little too spontaneous and laid back – I use lists to try to change that, but haven’t been very successful. Seriously – your list is one I could live with! …and journalling I couldn’t live without! Absolutely! I couldn’t function without my lists, yet I feel like I’m very spontaneous! It’s all good! Ugh, I have too many lists. I think I’ll stop making lists and be more spontaneous. Good luck with your three items!